Since the opening up in the mid-1990s, uranium exploration in Mongolia by international companies has not been subject to any clear national policy or close regulation. In the last few years, however, the Government has sought to exercise more control over the whole mining sector and earlier this year it set up MonAtom to undertake uranium exploration and mining on behalf of the state, as well as to pursue nuclear energy proposals. It will hold the state’s equity in uranium and nuclear ventures, under the Mongolian Nuclear Energy Agency. In mid-July, after consultation with the International Atomic Energy Agency, Parliament passed a Nuclear Energy Law to regulate the exploration and mining of uranium and give the state a greater degree of ownership and control of those resources. Along with this the Government set up Dornod Uran, a joint venture company between MonAtom and Russia’s ARMZ to develop two uranium mines in Mongolia — Dornod and nearby Mardai. A Japanese partner, evidently Marubeni, is also expected to be later involved in the work of this joint venture. The development is of particular interest to Russia due to its proximity to the Priargunsky operations, allowing possible creation of a ‘single infrastructure. At least until mid-August, Canadian based Khan Resources owned a 69% share in the Dornod project, mostly through its 58% subsidiary Central Asian Uranium (CAUC). The balance of CAUC, which holds Mongolia’s only uranium mining license, was owned by MonAtom and ARMZ, each with 21%. A definitive feasibility study released in March 2009 showed that the $333 million project was sound, on the basis of 24,780 tons of indicated resources, including 20,340 tons of probable reserves. Annual production of 1,150 tons over 15 years from 2012 was envisaged. However, the Nuclear Energy Agency has announced that the joint venture of MonAtom with ARMZ will develop the project to annually produce about 2000 tons. Khan is uncertain where it stands, having apparently been dispossessed as it sought to negotiate an investment agreement with the Government. Gurvanbulag is another deposit, about 30 km away, which has been held by the Canadian Western Prospector Group. This March the company agreed to a $25 million takeover by China’s CNNC International, a 74% subsidiary of CNNC Overseas Uranium Holding and through it, of SinoU. MonAtom appears to be positive about this development. 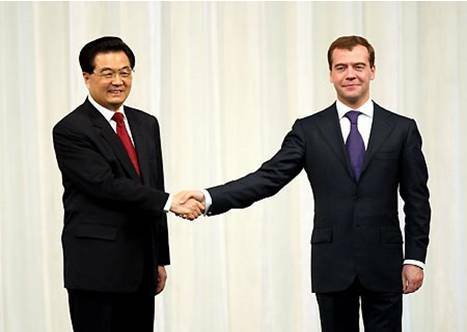 As an aside, I think the photo above says a lot about Sino-Russ relations …. Once again we in the U.S. will get caught behind the curve. It’s our own fault, we elected these people.